Catering to the requirements of our clients, we are involved in offering Cubicle Plywood Box. In order to keep pace with never ending demands of the customers, our company is instrumental in offering Plywood Storage Box. Being the well-distinguished companies in the market, we are into offering Cubicle Plywood Box. Nefab offers a wide range of plywood boxes and shipping crates – smaller one-unit solutions to larger solutions with up to six separate pieces, all foldable for ease of storage. Our company holds vast experience in this domain and is involved in offering Storage Plywood Box. In order to keep pace with the never-ending demands of customers, we are involved in offering a wide range of Wooden Packaging Box. Our comprehensive range of plywood boxes are known for surface dimensional stability and durability. These are manufactured with high quality wood and are moisture treated that helps in preventing moisture from entering the boxes and damaging the stored goods. We use high-grade plywood in the fabrication process so as to make these boxes resistant to fluctuating temperatures and moisture. 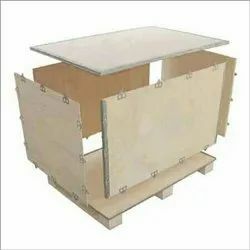 Our comprehensive range of Plywood Boxes is manufactured with high quality of wood and has been appreciated among our clients for their durability and reliability. Leveraging on our in-depth experience of professionals, we can customize the desired boxes for our valuable clients. For keeping reprints . Kailwood frame with plywood bottom. Fitted with clamp inside and index card holder and clips outside. We supply high quality plywood boxes which are suitable for both shipping and storage of your valuables. Our clients can avail these in customized designs.